Internal medicine physician Lara Charneco, of the NorthBay Center for Primary Care in Green Valley, firmly believes in the health benefits of pet ownership. 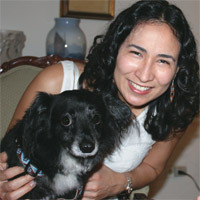 Growing up in Puerto Rico, she rescued many cats, dogs and small critters. Today she shares her life with Tukie, a dog she rescued 10 years ago on a Puerto Rican beach. Most Americans agree. According to the American Veterinary Medical Association, more than 57 percent of U.S. households own one or more animals. Pets do much more than offer unconditional love. Research shows they can reduce stress and blood pressure in their owners, increase longevity in those who have had heart attacks and even relax Alzheimer’s patients. And, meeting people can be easier when you have a dog in tow. Dr. Charneco and Tukie visit a local dog park two or three times a week, and as the dogs frolic, their owners get to know each other. Owning a dog can also get you off the couch and out walking. People who wouldn’t walk alone will make time to walk when they have a dog that needs exercise. If you’re interested in adopting a dog or cat, visit the Solano County Animal Shelter and help an animal in need. The shelter is open Monday through Friday from 10 a.m. to 6 p.m. and Saturday from 10 a.m. to 2 p.m. It is located at 2510 Clay Bank Road in Fairfield. For further information, call the shelter at (707) 784-1356.